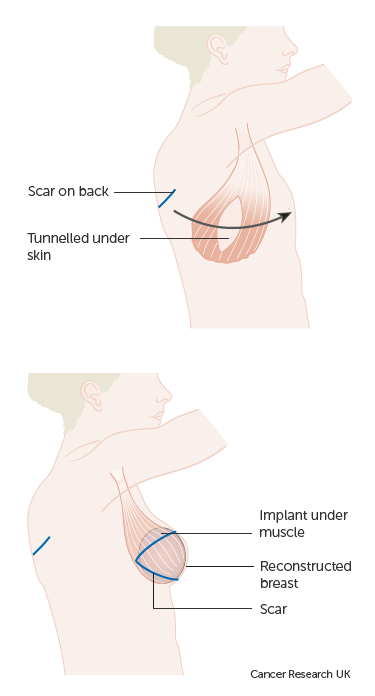 Your surgeon might be able to use your own body tissue to make a new breast during a mastectomy operation or some time afterwards. They call this a flap reconstruction. The surgeon takes skin, fat, and sometimes muscle (a flap) from another part of your body and makes it into a breast shape. The flap needs a good blood supply or the tissue will die. So the surgeon will leave the body tissue connected to its original blood vessels. Or they can cut the blood vessels and reconnect them to blood vessels under your arm or in your chest wall. If your surgeon leaves the flap connected to its own blood supply it is called a pedicled flap. If they connect the flap to new blood vessels, this involves microsurgery and they call it a free flap. You can't have this type of surgery if you have diabetes, are a heavy smoker, or are very overweight. If you have radiotherapy to a flap, this won't affect it straight away. But it is likely to cause changes to the reconstructed breast in the future. After about 10 years the flap might shrink, discolour, harden, or change shape. You might then need further surgery to create a flap from a different part of the body. The latissimus dorsi is a muscle in your back, under your shoulder blade. Its job is to move the arm into your side and backwards. Other muscles around the shoulder also do the same job. Your surgeon uses the muscle, and the skin and fat covering it, to make a new breast. You might need to have an implant put in as well if you have larger breasts. Or you could have the other breast made smaller. The surgeon tunnels the flap under the skin to the front of the body to make the new breast. This is called a pedicled flap. With this type of reconstruction, the flap keeps its original blood supply. You will have a scar on your back, roughly 6 inches (15cm) long. You can choose to have the scar horizontally so you can hide it under your bra. Or you can have it diagonally if you don’t want it to show under backless clothes. You can discuss the position of the scar with your surgeon. If you are having the reconstruction after your mastectomy, you will also have an oval scar on the reconstructed breast. A latissmus dorsi flap operation takes less time to recover from than an operation using the abdominal muscles. You will be in hospital for about 4 days. It takes about 4 weeks to get over the surgery. A T-DAP operation is similar to a latissimus dorsi reconstruction but leaves the muscle in place in your back. The rectus abdominis muscle is in your abdomen and runs from your breastbone to your pubic bone. For a TRAM flap reconstruction the surgeon takes part of this muscle, with its skin, fat, and blood vessels. They move it to your chest wall to make a new breast. The most common way of creating the new breast is called a free flap. Your surgeon completely cuts away the skin and fat from the abdomen. They then connect the flap's blood vessels to blood vessels in the chest wall or armpit. The surgeon will stitch up your abdomen in a similar way to having a tummy tuck. After the operation, you stay on bed rest for about 48 hours. You have a tube draining urine from your bladder (a catheter) so you don't have to get up. Your room will be kept very warm to encourage a good blood flow to the flap. You will have a scar running across your abdomen (horizontally). If you have the reconstruction after you had your mastectomy, you will also have an oval scar on the reconstructed breast. You might feel uncomfortable for a while after your abdominal operation. Recovery takes longer than for the back flap method and you will be in hospital for about a week. It will be about 7 weeks in all before you have recovered. But it takes another 6 months or more before your tummy is as supple as before. There is a risk of blood clots blocking the blood vessels in the flap, which cuts off the blood supply and the flap tissue will die. This is a serious complication and happens in about 3 to 5 out of every 100 free TRAM flap operations (3 to 5%). After TRAM flap reconstruction, the abdominal muscle can be weaker. This increases your risk of having a hernia in the future. Between 1 and 5 in every 100 women (1 to 5%) who have this operation have a hernia some time afterwards. Sometimes surgeons fix a piece of mesh in place during the operation to help strengthen the abdominal wall. A DIEP reconstruction is very similar to abdominal muscle reconstruction. But the surgeon only takes skin and fat from the abdomen to make the breast shape. They leave the abdominal muscle in place as they remove the skin and fat along with the blood vessel that keeps the tissue alive. The surgeon carefully teases out the blood vessel from the muscle. The advantage of this operation is that the abdominal wall is not so weakened, because the muscle is still there. So there is less risk of hernia afterwards. DIEP stands for deep inferior epigastric perforators, which are the blood vessels used in the reconstruction. About 1 in 6 women may have an SIEA flap instead of a DIEP flap. This means that the surgeon uses a different blood vessel (the superficial inferior epigastric artery). With these flaps the surgeon uses microsurgery to join up the flap’s blood vessels to small blood vessels in the chest wall or armpit. As with the free TRAM flap, the blood supply can become completely blocked off with clots. About 1 in 10 women (10%) need to go back to the operating theatre within a few days to improve the blood supply. If the blood supply is cut off, the flap tissue dies. This happens in about 3 to 5 out of every 100 (3 to 5%) DIEP or SIEA flaps. With a DIEP flap there is a higher chance of small areas of fat tissue dying off within the flap. The DIEP flap allows you to keep as much abdominal strength as possible.So you might want to have a DIEP reconstruction if your abdominal strength is very important to you. But it is important to weigh up this benefit against the higher failure rate compared to back muscle reconstructions. Your surgeon might use microsurgery to move fat and skin from the buttock to create new breast tissue. Taking tissue from the upper part of the buttock is a superior gluteal artery perforator flap (SGAP). Taking tissue from the lower part of the buttock is an inferior gluteal artery perforator flap (IGAP). Taking tissue from the buttock leaves a dent in that area and a small scar. Because the buttock tissue is often thicker than normal breast tissue it means your new breast can be a bit firmer than with other types of reconstruction. These operations are more difficult than taking tissue from the back or abdomen and more likely to have complications. 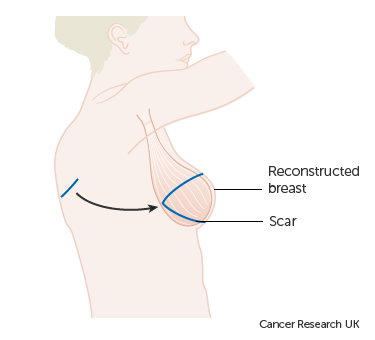 So this type of reconstruction is not commonly used and is generally for women who can't have other types. Your surgeon might offer it if you are too slim to take tissue from the abdomen or if you have scarring from previous surgery in the abdomen or back. Only a few surgeons in the UK can do this surgery and you might need to travel to a specialist hospital. Your surgeon might use microsurgery to move fat, skin and muscle from the upper part of the thigh. Taking tissue from the outer part of the thigh is called a transverse myocutaneous gracilis flap (TMG), a lateral thigh flap, or a saddle bag flap. Taking tissue from the inner part of the thigh is a transverse upper gracilis flap (TUG). The operation leaves a dent in the thigh and a scar. These operations generally only give a small amount of tissue. So your surgeon might only consider them if you can’t have back or abdominal muscle reconstruction. Your surgeon may offer these operations if you are too slim to take tissue from the abdomen or if you have scarring from previous surgery in the abdomen or back. Only a few surgeons in the UK can do this type of reconstruction and you may need to travel to a specialist hospital. Surgeons can adjust the shape of the breast by taking fat away from some areas or injecting fat into the breast. They call this lipomodelling. This technique can fill in dents in the breast after wide local excision. It can also reshape the breast some time after breast reconstruction. To remove areas of fat from the breast the surgeon inserts a narrow tube (cannula) into the fat through a tiny cut (incision). They create suction using a vacuum pump or a large syringe. You can have the procedure under local anaesthetic or general anaesthetic. You might have fluids through a drip during and immediately after the surgery. The scars from this procedure are small and in an area where they can't be seen. Sometimes, the skin surface might be irregular in the area of treatment, especially in older people. Sometimes doctors can inject fat from other parts of the body into dents in the reconstructed breast to give a normal shape. Doctors call this fat injection or lipofilling. They can take the fat from the tummy or thighs using liposuction. Some surgeons have reported that injecting fat into the breast seems to reverse some of the side effects of radiotherapy. It seems to reduce thickening of the tissue in the radiotherapy area and reduce skin tightness. It might also lessen the appearance of blood vessels under the skin (telangiectasia). Some small research studies seem to support this finding. There are some theories about why the fat reverses these radiotherapy side effects. Surgeons think that stem cells in the transplanted fat tissue might stimulate healthy breast tissue to develop in the area. Or it may be because fat can create new blood vessels that increase the blood supply. After the surgery you need to do some exercises to get your arm and shoulder moving properly again. Your nurse or physiotherapist will show you what to do and explain when to do them. While doing the exercises it helps to wear a supportive and comfortable bra that isn't under-wired. The types that have a front fastening are easier to get on and off. If you have any swelling, you might need a slightly larger size than usual for a short time. Your bra can often help to support and mould the reconstruction and your surgeon or breast cancer nurse can advise you about this. You can call the Cancer research UK nurses for information on freephone 0808 800 4040, from 9am to 5pm, Monday to Friday.